We’re aiming to build an army of supporters to make some real change for people with learning disabilities in the UK. We’re delighted to announce that we’ve been successful in receiving funding from the Esmee Fairbairn Foundation to develop the work we started with the launch of the Stay Up Late campaign back in 2006. 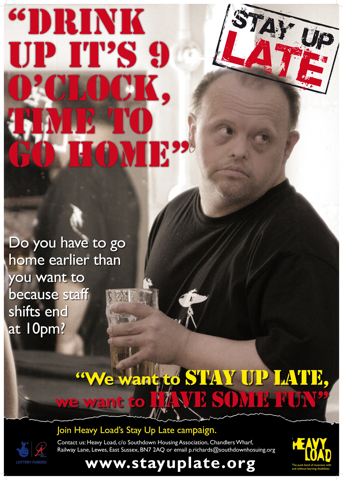 When we started Stay Up Late (before we became a registered charity) it was because of our experiences as Heavy Load, playing gigs up and down the country and commonly seeing our fans leave at 9pm because staff weren’t able to work flexible shifts. Luckily for us we were having a feature documentary made about us too at the same time and so the issue of Stay Up Late got a huge audience when the movie came out at cinemas, on the BBC and on TV in the US. The thing is we had no particular plan, we were frustrated, sometimes angry, and had a simple message ‘we want to Stay Up Late we want to have some fun’. This resonated with so many people because not only are active social lives incredibly important for us all to keep healthy and develop relationships with other people, but it’s also about having the right to exercise choice over the way you live your life. When the campaign launched, and the movie broadcast, we were inundated with people supporting us and we were free and easy with our logo. We wanted as many people to take up the campaign and make an impact where they lived. To this day we still hear on events we’ve supposedly put on in various parts of the country which we had no idea about. And that’s a good thing! The things is we’re a tiny little organisation, we currently employ 4 staff and only one of those is full-time. When we applied to Esmee Fairburn we were honest about the original campaign having no particular plan, but that it had a huge impact. So we said, just imagine what we could achieve if we did have a plan and could map what our influence has been. And this is where Stay Up Late 2 starts. We’ve been doing a number of talks and workshops at conferences over the past couple of years to try to identify what the blocks are to people with learning disabilities truly leading the lives they want. Whilst austerity cuts are a big factor we also have to remember that the issue of not being able to Stay Up Late was first raised in 2006, 2 years before austerity started. We believe a lot of the issues are also cultural and something can be done about this. Over the next 3 years we’ll be developing the campaign and working to share ways in which people are making positive change, whether that’s support staff who are creating flexible support systems, commissioners who are finding new ways to create services that work for individuals or maybe people with learning disabilities who’ve been able to say ‘sod this’ I want to live my life differently. We want to keep all of this positive too – now is not the time for moaning any more – it’s time to try and make positive change happen. We’ve been quite quiet with the newsletters recently as we’ve been so busy with our Gig Buddies work but that’s about to change. Share this email and encourage your friends and colleagues to sign-up to our mailing list too. For this plan to work we need to develop our networks and we’ve set the ambitious target of doubling our mailing list this year. That means you just need to get a couple of friends to sign up each. That’s all for now and we’ll be sending out more updates for what we’ve got planned – but for now please just try and encourage as many people as possible to get involved and let’s try and make some positive change happen.